Lifespan, brightness and efficiency are important factors in selecting lights for any purpose. Standard incandescent lights operate when an electric current is sent through a filament, which produces heat, and the heat produces light. Light-emitting diodes (LED) produce light through a process called electroluminescence, in which a substance acted upon by an electric field produces a cold light. Each type of bulb offers different brightness, wattage and energy efficiency. The efficiency of a bulb can be assessed in terms of its overall lifetime, yearly cost and wattage use to produce light. An LED light has an average lifespan of 50,000 running hours compared to a 1,200 hour lifespan of a incandescent bulb producing the same brightness. To produce the same amount of light as a 60-watt incandescent bulb, an LED bulb uses an average of seven watts. The energy efficiency of an LED bulb translates to a yearly average running cost of approximately $30 compared to $325 for an incandescent bulb producing the same amount of light. The brightness of a bulb is measured in lumens. Bulbs require a certain amount of electricity, measured in wattage, in order to produce a certain amount of lumens. LEDs are significantly more efficient at utilizing wattage to produce lumens. For example, to produce a low end of 450 lumens, an LED bulb requires five watts, while an incandescent bulb requires 40 watts. To produce the higher end of 2600 lumens, an LED bulb uses 25 watts, while an incandescent bulb requires 150 watts. Besides the cost savings, many homeowners switch to LED lights because they are more environmentally friendly than incandescent bulbs are. Carbon dioxide emissions are a significant contributor to greenhouse gases. An average household using 30 incandescent bulbs for a year will create 4500 pounds of carbon dioxide emissions. In comparison, if the same household used LED bulbs, it would contribute just 450 pounds of carbon dioxide emissions. Both incandescent and LED bulbs face usage limitations that impact homeowner purchase decisions. Incandescent bulbs are affected by weather and atmospheric conditions that reduce either the brightness or the lifespan of the bulb. Both extreme cold and high humidity can impact the performance of the bulb. 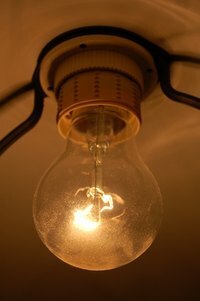 Incandescent bulbs are made of delicate glass cases and thin filaments that may break due to contact or power surges. LED bulbs suffer from directional lighting; the light emitted from a single LED bulb will only illuminate an area directly below or in front of the bulb. LED bulbs are also fairly small, and several bulbs are required to create a complete fixture that provides adequate light coverage. Another large problem for LED bulbs in household use is that LED lights do not give off true white light; instead, "white" LED lights emit a blue-hued light than many homeowners do not find as pleasingly ambient as true white. The Simple Dollar: The Light Bulb Showdown: LEDs vs. CFLs vs. Incandescent Bulbs – What’s the Best Deal Now And In The Future?